And this soup is crazy good. 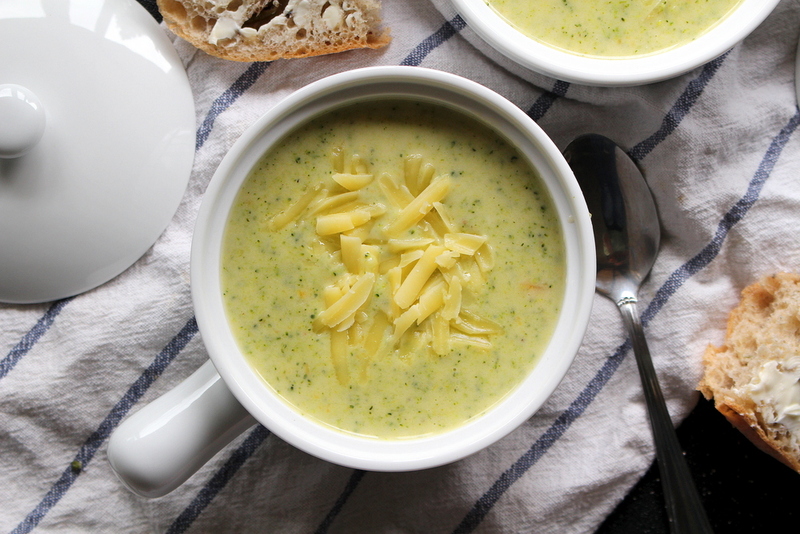 So good that you won't want to buy pre-made broccoli cheddar soup ever again. It's surprisingly easy, and comes together pretty quickly. Most of the time I will tweak a recipe if I intend to share it on the blog. It feels weird to share something that I didn't put my own twist on, even if it's a small one. But this one was perfected by Deb and I couldn't bear to change it. I served the soup with my favorite crusty bread: Trader Joe's olive loaf. So flipping good. I also left my soup a little chunky, you can puree it completely smooth or leave some bits. You do whatever you fancy. Naughty. I have to say that Percy is the biggest pig. Never in my life have I seen a cat beg for food like he does. This soup is the definition of cozy fall food. You need this in your life. In a large heavy pot over medium heat, melt the butter. Add the onion and garlic, and cook until softened, about 3-5 minutes. Add the flour and cook until golden, roughly 3-4 minutes. Then gradually whisk in the half-and-half until smooth. Add the chicken stock, bay leaf, salt and pepper and bring to a simmer. Reduce the heat to medium-low and let cook (uncovered), stirring occasionally until thickened, about 10 minutes. Add the chopped broccoli and carrot to the mixture and simmer until tender, another 15-20 minutes. Discard the bay leaf and puree the soup to your desired texture. You can use an immersion blender, or in an upright blender. Once blended, add the cheese and whisk until melted. Taste the soup and season with more salt and pepper if desired. Serve in bowls garnished with more cheese and crusty, buttered bread.